The International Chemistry Olympiad started in Eastern Europe in 1968 and has grown to about 75 countries with New Zealand first competing in 1992. The NZ Chemistry Olympiad is a charitable organization managed by a group of trustees and each year the program is run on a voluntary basis by a small group of dedicated secondary and tertiary teachers. To compete a student must be under 20 years of age and enrolled in a secondary school. To be eligible for travel to the International competition the student must be at least 15 years of age at the time of travel. A training program during term 2 for the final 4 students (in anticipation of international competition). The International Chemistry Olympiad examinations are arduous and involve a 5 hour practical examination followed 2 days later by a 5 hour theoretical examination. These occupy only 2 days of the week the students spend at the Olympiad, the remainder of the time allowing the students to establish personal and friendly contacts with other like-minded secondary students from a diverse range of cultures. They also are able to get acquainted with various aspects of the life of the host people and country. Why is the Chemistry Olympiad worthwhile? The sending of teams to the Olympiads provides very powerful motivation and challenge for capable students. The training programs provide a cost-effective approach to enrichment to a wider student population beyond that provided in secondary schools. It attracts top students to a career in science or mathematics. Contact by students and leaders with their counterparts in many other countries benefits science and mathematics education in New Zealand. Teachers as well as tertiary lecturers are regularly mentors for the teams. 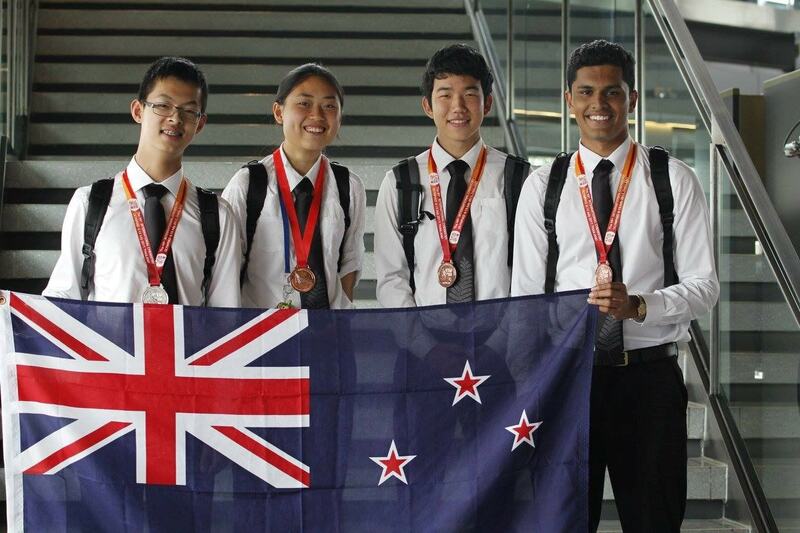 The performances of the team members demonstrate that the New Zealand education system can produce students that are the equal of the best in the world. The 49th International Chemistry Olympiad competition was held at Mahidol University in Bangkok, Thailand, from 6–15 July 2017 and it was opened by Crown Princess Sirindhorn. Our team members were Janice Ho (Macleans College), Zijun (Allen) Hui (Macleans College), Milidu Ratnayake (Auckland Grammar School) and Sangheon (Harry) Yeom (Auckland International College). The head mentor was Dr Owen Curnow (University of Canterbury), Stephen McCracken (Mt Roskill Grammar School) was the mentor, and Katrina Graaf (University of Auckland) was an observer. The team departed from Auckland on 3 July and stopped for three nights in Kuala Lumpur to acclimatise to both the change in weather and the time difference, as well as to fine tune their training. This was highly beneficial, especially since the five hour lab exam was to take place in non-air-conditioned labs. We felt that the five-hour practical exam was shorter than is normal and, indeed, all of our students completed all of the tasks. Similarly, we felt that the five-hour theory exam was relatively easy compared to previous years (three of our students attempted all parts of all questions), nonetheless, it produced a good range of marks across the 297 students (from 76 countries). In the final analysis, Allen received a silver medal while the others all got mid to high bronze medals. Overall, based on placings, we were one place ahead of Australia (although in terms of medals they got two silver medals) and well ahead of Canada, Ireland, France and Germany. We were 25th out of 76 countries, which is an impressive result considering our population. As always, the students had a busy and eventful schedule and were extremely well looked after by their wonderful liaison Cathliya Promdonkoy. The mentors, as usual, had many late nights in arbitration and Jury meetings but were grateful to only have to translate Thai English to Kiwi English. We still managed some time for relaxation and shopping and were also given tours to the Grand Palace and Ayutthaya. The 2018 IChO will be held in Slovakia & Czech Republic.